Bioethics is a field of inquiry and as such is fundamentally an epistemic discipline. Knowing how we make moral judgments can bring into relief why certain arguments on various bioethical issues appear plausible to one side and obviously false to the other. Uncertain Bioethics makes a significant and distinctive contribution to the bioethics literature by culling the insights from contemporary moral psychology to highlight the epistemic pitfalls and distorting influences on our apprehension of value. Stephen Napier also incorporates research from epistemology addressing pragmatic encroachment and the significance of peer disagreement to justify what he refers to as epistemic diffidence when one is considering harming or killing human beings. 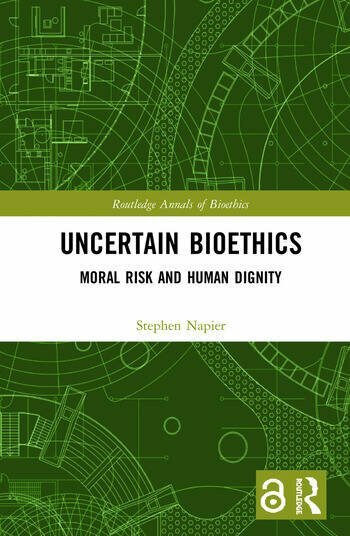 Napier extends these developments to the traditional bioethical notion of dignity and argues that beliefs subject to epistemic diffidence should not be acted upon. He proceeds to apply this framework to traditional and developing issues in bioethics including abortion, stem cell research, euthanasia, decision-making for patients in a minimally conscious state, and risky research on competent human subjects. Stephen Napier is an associate professor of philosophy at Villanova University. His previous publications include Virtue Epistemology: Motivation and Knowledge, and he edited Persons, Moral Worth, and Embryos. His interests include epistemology, bioethics, and the metaphysics of persons.